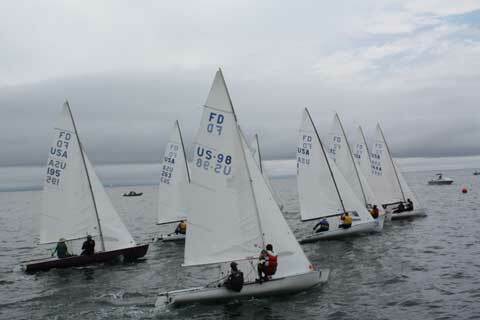 Today was the start of the 2012 Flying Dutchman North American Championships. This storied former Olympic Class held the 2nd of 3 FD events at the Santa Cruz Yacht Club in Santa Cruz California. 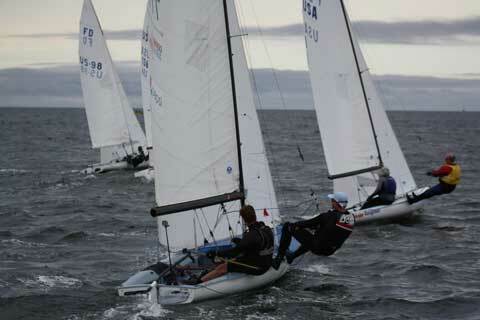 The first regatta was the FD National Championships in May. Two top competitors had sold their boats in preparation of the receipt of their new boats for the Worlds. Philippe Kahn the newest US FD from one of them, and was learning the ropes with the help of Steve Bourdeau (former 1992 Olympic silver medalist crew and local 505/Laser driver). The races were held in conditions that included 30+ mph gusts and generally an overwhelming amount of wind. Two masts broke; one race had 4 boats that needed rescuing (the wind and waves were from quartering directions). The weekend conditions were so difficult that several competitors thought better of sailing and retried for the remainder of the races. This 1st day of the North Americans was one were the birds were chirping, sun was shining, the waves were insignificant, temperature was in the 60’s, and the wind was between 6-10 knots. This was a nice southern California/east coast sailing day. This was not a typical summer in Northern California. 9 boats signed up with many competitors preparing their new boats for the Worlds Championships in September. Others declined to attend expecting the conditions to be difficult. The first race was postponed for 45 minutes until the wind filled in. The conditions were benign and genuinely enjoyable by all. All of the boats completed the races. The first was a windward leeward. The second was a triangle, windward leeward, then another triangle. The last race was a triangle, windward leeward. The results were Philippe Kahn and Steve Bourdeau with three bullets and the rest of the boats behind in his wake. The closeness of the finishes is not obvious by the placing. Philippe managed to sail through the fleet when behind and extend when he is in front. Buzz Ballenger and Kurt Hemmingsen, as well as Tim Sayles and Matthias Kennerknecht have been providing steady pressure on Philippe throughout the day and were in close proximity throughout the day. The races saw the leaders change positions throughout the day. The eventual outcome was Philippe and Steve finishing first. The third wave of racers in a lesser speed/pointing range. The Santa Cruz Yacht Club and race committee have used the first FD two events to prepare the committees and facilities for the upcoming FD World Championship. The North American Championships are a precursor to the FD Worlds occurring September 23rd. Currently 47 boats are committed and preparing for (or in) containers from the Europe FD community. There are more (2 containers = 8?) FD’s coming from Australasia (New Zealand and Australia). The North American FD contingent round out to be around 15 more boats. The expected total numbers look to be potentially around 65-70 boats. The second day saw a continuation of the unusual light conditions. The start was delayed for 35 minutes at 1200 until a westerly wind condition strengthened and appeared to stabilize. The challenged Santa Cruz Race committee called for three double sausage courses. The conditions saw shortened courses and winds that shifted 30 degrees giving aware competitors advantages that others did not see. Some positions shifted from first to fourth, while others held thier places through close quarter competition. The single constant was that Philippe Kahn and Steve Bordeau continued to dominate by making good calls and maintaining some of the best consistent boat speed of the group. He leads the NA's with two races remaining. A second group of three in trail (with the exception that Tim Sayles and Matthias Kennerknecht broke through with two wins in the second and first races). Then another group of 5 boats. Mention needs to be made about the efforts and organization of the Santa Cruz YC. The courses, crash boats, breakfast, Saturday dinner, hospitality and trailer valet has been memorable. The competitors have appreciated the friendliness and casual yet professional nature of those involved. Third day of the North American Flying Dutchman North American Championships in Santa Cruz California presented a different twist to the series. Only two races were held. There was a postponement for the first race. The more typical wind arrived in time for the third. The second raced winds were in the 12-15 knot range with sunny skies, 75 degrees, and a mild swell. Although the racing participation was less than the expected, the racing was close and enjoyable. Amazingly close after 6 miles, seven lead changes that we saw and over an hour of racing. What a great race to watch! The Santa Cruz Yacht Club displayed an amazing amount of organization and effort in preparation for the 2012 World’s Championships. The all volunteer organization had more people practicing for the Worlds than actual FD competitors. The club had hoist attendants, boat trailer valets. Breakfast was available in the morning, as well as dinner in the evenings. The results changed in the front in second, third, and fourth spots. Philippe Kahn/Steve Bordeau continued on to win while being contested and bested by Tim Sayles/Matthias Kennerknecht in 4 out of the last 5 races. They sailed the regatta with their backup metal mast. Their carbon mast broke at the nationals and they are waiting for the arrival of the replacement carbon mast. They moved from 4th on the first day to a tie on the second day with Buzz Ballenger/Kurt/Hemmingsen and alone in second by the final day. Buzz/Kurt completed the regatta in 4th place. Zhenya Kirueshkin-Stepanoff/Chris Wrenn touched out Buzz/Kurt on the final day to secure the final spot on the podium. After the required 45 minute postponement, the two remaining contests began. The day saw two long double sausage races. The first race had 30 degree varying wind shifts in the first race; this caused major havoc and lead fleet wide changes until the racers understood that the shifts were oscillating and periodic. 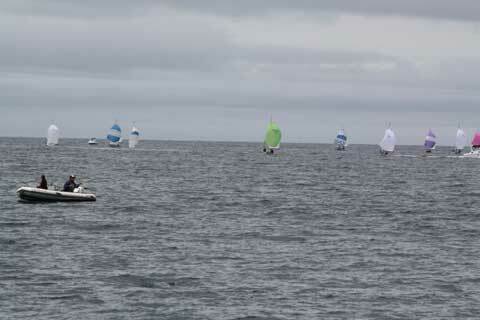 The racing was close, with most boats in close proximity to each other throughout the day. Tim/Matthias dominated the final day and closed on Philippe/Steve. The comments from the sailors was that this was one of the most enjoyable regattas in recent history.